...BBC Radio Five Live carried an astonishing interview (by, of all people, Nicky Campbell) with Paul Gambaccini which is easily the most revealing piece of journalism associated with the entire saga. A full transcript is available, courtesy of Ian Wylie at the Manchester Evening News, here. 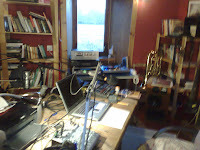 A beautiful day in Shetland...and the Radiocroft with its digital heart relocated to the main room downstairs.. Here's a confession: I'm a Jonathan Ross fan. I think his Saturday morning radio show frequently ascends to brilliant heights, though the pally interviews with the likes of Ricky Gervais and the constant puffing of David Bowie can become wearying. Well, I say I'm a Jonathan Ross fan. In fact, I'm a Jonathan Ross and Andy Davies fan. And here it's worth pointing you in the direction of Andy's own little corner of the BBC megasite, where he describes his role on said radio show. Devil's Advocate - I've made this a distinct category because I believe it is a very important part of how the show has been received. If I agreed with everything Jonathan said, it would be a waste of time to be there, challenging him once in a while brings out the best in Jonathan, and gives him a chance to show off his depth of knowledge and be entertaining with it. Andy's advantages (and he's flown in from Spain every week just for the show, so it's obviously recognised) rest on his experience, his knowledge and his maturity. He's been around the block a time or two, and he's not afraid of Ross. Who's always on the edge of that bullying sense of over-worth that's endemic among successful presenters. Especially those getting £6million a year from the BBC. and elsewhere) is rooted in weak production. An absence of Andy, in fact. It's said that the producer looking after the segment (which was pre-recorded, unbelievably) is aged 25. Asking someone as young and presumably inexperienced to cope with the monstrous egos of Brand and Ross in full, self indulgent flight, is ridiculous. But the fact that this whole section was sent up the management line, allegedly, and approved for broadcast in the cold light of day, is about something else. And that something else is celebrity power. Ross and Brand carry enormous clout and certain sections of the BBC are utterly under the sway of celebrity. To be precise, celebrity agents. Brand is not Jonathan Ross, who possesses a ferocious intelligence and tremendous knowledge (film, trivia and music), not to mention that crucial weapon for radio presenters, warmth. Brand is almost entirely a product of agency grooming and hustling. His actual talent is minor, disguised beneath his looks, image and terrified, convoluted verbals. His humour depends on aggression, derision and toxic scorn. Let's have a wee look at the management muscle behind Ross and Brand. Ross is represented by Addison Cresswell at Off the Kerb, who also have Jack Dee, Mark Lamarr (regular Ross radio-stand in and Radio 2 presenter) Jeff Green (also frequently on R2) Phill Jupitus (formerly BBC Six Music), Rowland Rivron (R2 again) Sean Lock, Alan Carr, Mark Steel, Andy Parsons and others. Brand is managed by John Noel, who also has Dermot O'Leary (Radio Two), George Lamb (Six Music) gardener Diarmuid Gavin, Mariella Frostrup, Tess Daly and the One Show's Christine Bleakley. Both have a host of 'new talent' They are keen to boost along the path to Ross-dom and Brand-dom. Now that, from any point of view, is serious clout. More than I'm saying, in fact - take a look at their websites. From the BBC's point of view, negotiating with that kind of muscle is both easy and hard. It's easy just to take what they offer and it's hard to get on the wrong side of them. Give the unknown a try, go on. Oh, and we've got those contract renegotiations for your big time glamourpuss celebrity success coming up, haven't we? Haven't we? Have another glass of Mimosa, darling. So, the BBC's promised investigation of the Brand-Ross-Sachs horrorshow: what is the likely outcome? A case of deputy heads must roll? Will Brand and Ross get off Scot-free? For an offence which would have brought instant dismissal for all concerned in any other industry, and possible police action (breach of the peace in Scotland, harassment in England)? No. And it's Ross who will suffer most. The once-obvious Wogan succession now looks distinctly wobbly. He's of an age where he needs to lay foundations for elder-statesmanhood, not sad dad-rebel-without-a-contract status. Brand's a one-trick donkey who will fade as his paunch grows and his hair falls out. But Jonathan's a real talent. If only he'd had Andy by his side, this would never have happened. In the end, celebrity power, wielded by the big agents, will tell. Expect the production staff involved to bear the brunt of blame. A quiet period from Brand and Ross, and then they'll be back. Ross may be irreparably damaged long-term, but hey, think of that £18 million three year deal. It'll last him for a few years yet. And his wife, Jane Goldman, is now a successful movie scriptwriter. ...details of our weekend trials at The Shetland News. Ferries are all over the place...no imported food in the shops ('sooth bread' has vanished) and looks like severe disruption for the rest of the week. I'm due on the boat south on Thursday night - let's hope things have settled down by then. There's Neville, psychokiller cat, hypnotised by the candles last night. No, it's not Photoshopped! 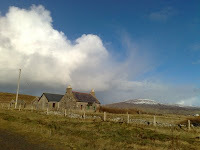 And that's Hillswick, on one of those fantastic post-storm days when you really just have to get out for a wander. And now...the northerlies! ...or thereabouts. This is Eshaness at about 2.30pm today, Saturday, from the lighthouse car park. Sorry about the shoogly video. It was extremely windy. With gusts of anything up to 80 mph even the Mighty Torslanda was creaking on her springs. As for the three thrill-seekers who had left their car and were leaning almost horizontally into the wind, anoraks extended like wings, no doubt one of them survived to tell the tale. It's so windy at the moment that the seas are being flattened. It's also very murky, so the cliffscape is not as spectacular as it might be. So far, the power has stayed on - always the way when you invest heavily in petrol for the generator. I heard - indeed, was rivetted by - Randy Newman on BBC Radio Four's Desert Island Discs this morning. (I'd provide a link here, but for peculiar 'music rights' reasons, Desert Island Discs is not available on iPlayer or Listen again) For the first time in my life I was convinced that Kirsty Young actually knew what she was talking about: insightful questions, for the most part, though she ignored( I think: had to do morning stuff as I listened) the huge importance in the post-Katrina rehab of New Orleans of the astonishing song Louisiana 1927. Newman (Oscar-winning soundtrack composer, orchestrator, arranger, notably on Toy Story I and II) is the greatest living singer-songwriter, despite(or because) of only making three albums in the last 20 years. His music, often drawing on hymnology and ragtime, veers from the achingly simple to meticulous parody and classical tribute. But his lyrics are easily the equal of Raymond Carver's best epigrammatic short stories. He is unafraid of truly appalling, and sometimes compulsively seductive first-person narrators (Rednecks, Short People) or of dealing in multi-layered narratives. He goes where no other songwriter has ever gone, both in black humour (Political Science) and this, a song which leaves me breathless and awed every time I hear it. Sorry about the sound quality and the uneasily moronic laughter at the start. But this is as sophisticated and emotionally insightful as songwriting has ever been. Oh, and Desert Island Discs is repeated on Sunday morning. There's loads more performance stuff on YouTube. 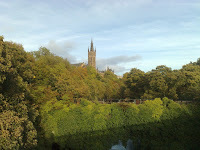 Autumn's my favourite time of year to be in Glasgow, probably to do with memories of University and the beginning of term, all that hope and expectation. Anyway, it was good to be in the Dear Green Place as it began to turn red, yellow and brown, with James and Martha. Susan, alas, was stuck in Shetland as we were unable to find anyone who could look after the redoubtable Lulu. It was her turn to stay at home, honest! We stayed, first of all, at the new Travelodge at Braehead (the Krankies were also in residence)and visited what must be the worst Pizza Express in the world, at the XScape indoor skislope thingy. Rooms were OK at the TL, but the promised WiFi didn;t work and the breakfast was an abomination. Thank goodness for IKEA's cheapo pre-opening canteen offers: £8 for full ('Bigger') breakfasts for three, and unlimited free coffee. We also had one night at the Etap, atop a car park in Springfield Quay. Cheap (£32 a room) but dirty and pitched somewhere between a student hostel and a prison. Vaguely threatening clientele, too, though the fresh-baked croissants were good. Still and all, we saw family and old friends and generally absorbed ourselves in Glaswegiana. Ate Japanese, Indian, Italian and Italian and Italian. The Battlefield Rest was magnificent. From there on in, it was luxury all the way: The Inn at Lathones, which hosted the Tom Morton Acoustic Showcase (Kevin McDermott and Esther O'Connor, with the Malt and Barley Revue next day) was absolutely lovely. Great rooms, superb food and the proximity of St Andrews. A million thanks to David, Nick and Jocelyn. A dash for Aberdeen, a rock'n'roll trip on the boat (gusting severe gale nine, but southerly, so that was OK) and we were home. And it's good to be perched on my red sofa with the Rayburn roaring and Lulu snoring. Have to go away again next week for a trip which will take in Belfast, Cookstown, Ullapool, Glasgow, Stornoway, Rodel in Harris, Inverness, Aberdeen, and Nairn, but that should be it before Christmas. God willing. Someone has hacked or hijacked my Google account. It seems to have originated from China, so any strange emails or posts are NOT from me. Apologies for any alarm or annoyance caused. 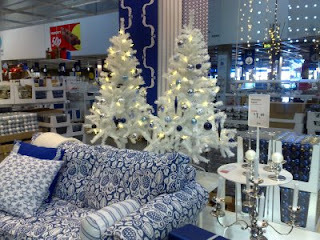 Following yesterday's amazing revelations of early Christmas decoration erection, I was in IKEA this morning (went in for the free coffee, was sucked around the Maze of Bankruptcy and ended up spending £75) and saw this. Not a great forecast for tonight - up to a force eight westerly as we wallow south - me, Martha and James - in search of curries, coffee and the systematic revival of the economy through Martha's shopping. Susan was meant to come but a dogsitting problem has developed, and as I HAVE to be south for the Acoustic Showcase at Lathones (not to mention staying behind to mop up the St Bernard slobber last time) I'm heading for Glasgow with the weans. The show will come from Pacific Quay from tomorrow through Friday. Just to remind you: The Acoustic Showcase at the Inn at Lathones (Fife, near St Andrews) is next SATURDAY AND SUNDAY - Saturday night, starting at 9.00pm, features KEVIN MCDERMOTT (solo) and ESTHER O'CONNOR; Sunday afternoon is THE MALT AND BARLEY REVUE - me, music, three free malt whiskies and some poetry. It's quite funny...that's at 2.30 pm. Tickets here. We're inviting listeners to send in their poetic meditations on 'money' today. The Tom Morton Acoustic Showcase gigs at The Inn At Lathones, Largowards, Fife, have had to be altered. The FRIDAY (17th October) show, with Yvonne Lyon and Dropkick, has alas had to be cancelled. The SATURDAY show, with Esther O'Connor and Kevin McDermott, will go ahead as advertised. So will the SUNDAY afternoon performance of the Malt and Barley Revue. ...namely KP, blogger of Inverness. See here. 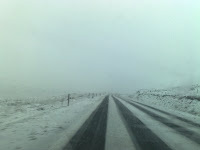 Blizzards on 4th October! Good grief! 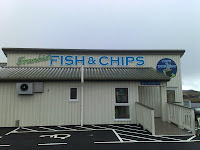 We ploughed through the sleet and snow to avail ourselves of Frankie's (named for the owner's late dog) in Brae, the UK's and possibly the world's most northerly fish and chip shop. And it's FANTASTIC! Not only the wondrous frying, the freshest fish in the universe and batter of an unearthly lightness but the presence of the legendary Maria's home-made bannocks. Jean-Christophe Novelli (in Shetland for the Food Festival this weekend) eat your unctuous reduction out. I'm responsible for the Sunday Herald's diary this week and next, so check it out if they put it up on their website, which sometimes, they don't. Otherwise I'll post it myself here. After the holidays (I'll still be broadcasting, but from Glasgow) there's the Tom Morton Acoustic Showcase at the Inn at Lathones, 17-19 October. 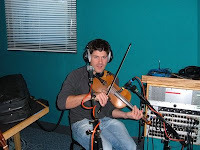 Featuring Esther O'Connor, Yvonne Lyon, Dropkick, Kevin McDermott and another performance of The Malt and Barley Revue. And before Christmas there will be other trips away for Whisky Live, a probable jaunt to Northern Ireland and then of course Children In Need in November, for which I'll be in Inverness. All this and some very exciting news I can't blog about until contracts are signed. Travel to and from Shetland for me has of late meant NorthLink ferries. I have to admit to having become a bit of a NorthLink fan - the 'new' (post-P&O) boats are relatively comfortable and mostly efficient, plus booking is both easy and very flexible. There's no charge for any changes or cancellations (immediate refunds if necessary) and sometimes I change bookings four or five times. Islander discount too. But if you're booking MAKE SURE you use the official NorthLink site (northlinkferries.co.uk) and and not the disgraceful imposter lurking at northlinkferries.org. Having said that, the longest and most dangerous ferry crossing within the UK archipelago can throw up some bad weather, highly conducive to, well, throwing up. I have never been sick yet, but that's due to various techniques involving steak pie, alcohol, chips, going to bed at 6.00PM and the seasickness pill called Phenergan. The video, by the way, is the Orkney ferry Hamnavoe, though the two Shetland boats Hjaltland and Hrossey are well nigh identical. And I've been onboard when this sort of thing has been happening.